Looking for the best MMA gloves? Well you’ve come to the right place. With so many different types of MMA gloves to choose from it can be hard to find the right pair for you. Some fighters even use different pairs of gloves depending on what type of training or sparring they will be doing. Many trainers believe one set of gloves isn’t enough, and this can be true depending on your skill level and if you plan on stepping in the octagon anytime soon. Remember, your gloves and a good mouthguard are the only two things protecting you in the octagon so make sure you invest wisely in your health and safety. Gloves are an important piece of protection that you must wear when practicing MMA. Many believe MMA gloves are there to protect your partner the same way boxing gloves do, however this isn’t true at all. MMA gloves are only for your own hand and wrist protection. Most MMA gloves are 4 ounces, so you can see how this isn’t much protection at all. It’s always recommended you wear a set of hand wraps under your MMA gloves. The truth is, MMA gloves can be very expensive. It’s important to find a pair of quality gloves that are more durable and longer lasting than a cheap pair that will only be good for a few months. There is a wide range of gloves at your disposal as a mixed martial artist. This guide will take you in-depth and explain all of the pros and cons of some of the best MMA gloves for training that are available today. It’s important to educate fighters on the different between MMA and Boxing gloves. The reason why this is important is because many fighters (including myself) try to cut corners and costs on almost everything. MMA gloves are one of the things you just can’t replicate with a pair of boxing gloves. The reason why you can’t use boxing gloves in MMA training is because you won’t be able to grapple with boxing gloves. Grappling with your opponent through clinching or on the ground is obviously an important part of MMA training. Another obvious difference between MMA and Boxing gloves are the weight and size difference of the two. Boxing gloves traditionally range from 8oz to 16oz, while MMA gloves typically range from 4oz to 6oz. This is a huge difference in size, not only when it comes to the protection of your hand and wrist, but also when it comes to the protection of your training or sparring partner. MMA is obviously one of the most dangerous sports out there, however you’re actually more prone to getting a concussion through boxing because of the amount of blows you can take through bigger and more padded gloves. In order to choose the correct MMA gloves size you have to measure the palm circumference of your hand as shown in the picture below. The following table shows the MMA gloves size that you should choose according to your hand. Sizes may vary depending on the brand. MMA glove weights vary by the type and function of the glove. Bag gloves traditionally weigh more than competition gloves because they have more padding to protect your hands. Sparring gloves are usually heavier to protect your sparring partner from injury. There are even some “hybrid” style gloves that are somewhere in the middle between competition gloves and bag gloves. This is important because there are many different styles of MMA gloves available. Today we’re going to talk about three different styles of gloves so that you can figure out what style is more suited for your type of training. Competition Gloves – MMA competition gloves have minimal padding and typically weight 4 ounces or less depending on the competition rules. The fingers are separated allowing movement and the ability to grapple and hold onto your opponent. It’s important to wear hand wraps or inner gloves under your MMA gloves because of the small amount of padding provided. Training/Grappling/Hybrid Gloves – This style of MMA glove can go by several names, usually I just call them my MMA training gloves. They have segmented fingers with padding covering up to the second knuckle. This type of finger design allows your hands and fingers to have enough movement to grapple while giving you some level of protection for punching. Should you wear MMA Gloves for heavy bag training? Sparring Gloves – When sparring in MMA and doing heavy bag workouts the main focus is on striking and punching techniques. MMA sparring gloves weight around 6oz to 7oz on average and have more padding around the top and front of your hand to protect them from unnecessary punishment. Similar to boxing gloves, MMA sparring gloves have a grip bar that helps form a tight first for punching, this also makes them less suitable for grappling style workouts. Remember, for non-MMA sparring (no grappling) it’s better to use boxing gloves. Leather vs Synthetic Leather – Leather is the higher quality of material and the best choice for MMA gloves. The downside to leather is that it’s much more expensive when compared to synthetic materials, however it’s much more durable and natural. Synthetic leather can also be a good option, but many fighters can feel the different between leather and synthetic leather MMA gloves. Foam Padding – The most common type of padding used in MMA gloves is foam. Many brands use a layered foam when constructing their MMA gloves, while others use regular foam. It all comes down to quality, the cheaper gloves will usually be less durable and less likely to hold up over months of use. It’s important to look for gloves with quality foam padding, read the reviews other users who have personally owned the gloves left. Wrist Strap – It’s always important to look for a solid velcro wrist strap when purchasing MMA gloves. The wrist strap basically holds the entire glove together and keeps your hand and wrist secure and tight. Country of Origin – Another important aspect to think about when shopping for MMA gloves is the country in which the gloves are manufactured in. The best MMA gloves are often made in Thailand (similar to shin guards), where the combat sporting gear industry has a huge presence. Cheap MMA gloves are often from countries like China and Pakistan and are made with cheap materials to cut cost. Sparring with MMA gloves can be risky because the gloves are so lightweight that damage is easily inflicted through punches. If you plan to spar in MMA it’s always best to buy heavier MMA gloves (such as 7 ounces). Sparring in MMA is much different than sparring in Muay Thai where you have heavier and much softer boxing gloves that are more forgiving. This is why you need the absolutely best MMA gloves for sparring. Remember, MMA sparring is much more useful for developing your transitions from stand up to the ground game. If you want to work on your pure striking skills then you should be “stand up only” sparring in Muay Thai or pure Boxing. It’s much safer to spar with heavier gloves as they are much more forgiving, however, it’s more likely to get concussions through repeated head trauma that comes from boxing with heavier gloves. I highly recommend visiting our ultimate sparring guide if you plan on sparring with MMA gloves. MMA sparring is great when it comes to grappling and learning how to fight standing up and transitioning to the ground game for some ground and pound. 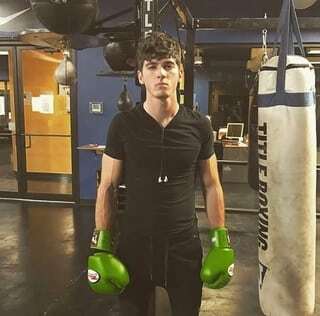 While you should only go as hard as your sparring partner in training, I would avoid sparring anyone who is going to lose their temper and start sparring hard with MMA gloves on. MMA sparring gloves are still light in padding and don’t offer nearly as much protection as needed when sparring hard. The Hayabusa T3 MMA gloves are ideal for grappling, sparring, or striking. They are perfect for fighters and athletes of all levels and will be a nice addition to your MMA equipment collection. The T3 includes a pre-curved design which helps reduce hand fatigue during sparring or competition and the Dual-X closure is unmatched when it comes to hand and wrist stabilization. The XT2 antimicrobial lining inhibits bacterial growth to minimize odor inside the T3 MMA gloves. The Hayabusa “Y-Volar” design delivers superior stability and control over the standard MMA glove. A consistent and contoured fit that stays securely in place whether you’re grappling or striking. The Hayabusa T3 gets a Guru Score of 9/10 because it’s a great MMA glove for both beginners and professionals alike. I truly believe these are the best MMA gloves for training and competing. I personally own these gloves and the ONLY problem I ever had with them was the initial break-in period. 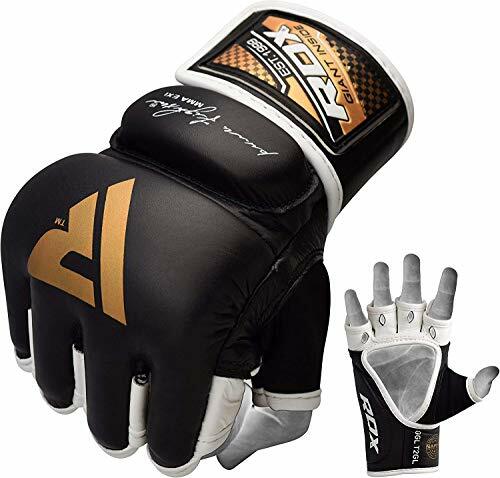 With the Venum Challenger MMA gloves you will find exquisite quality at an affordable price. Designed in Thailand and made with semi-leather, the Venum Challenger MMA gloves are perfect for both training in the gym and fighting in the octagon. The double-closure system provides easy access and a perfect fit while guaranteeing great comfort and support. The wide leather Velcro closure prevents the risk of wrist injury. With high-density layered foam, these MMA gloves offer you a wide range of protection. Each finger and thumb opening is reinforced, absorbing every ounce of shock for each strike you make. 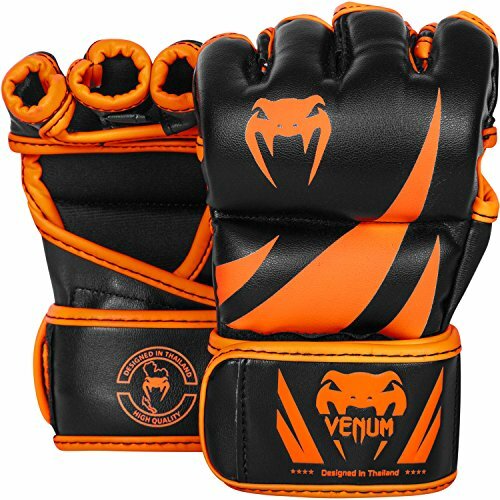 The Venum Challenger MMA Gloves get a Guru Score of 8.5/10 because of the high quality material and amazing design, both visually stunning and well crafted. We will talk about the upgraded Venum Undisputed 2.0 later in this article. Shock impact does not stand a chance against these RDX MMA grappling gloves with extra thick triple-layered gel-tech padding. These MMA gloves are integrated with shock-absorbent foam over the knuckle area and a padded block over wrist-joint area. The RDX MMA gloves are perfect for training, sparring or fighting in the octagon, you’ll feel nothing short of indestructible when wearing these gloves. These are underrated MMA gloves, the value is great for the low price-point. 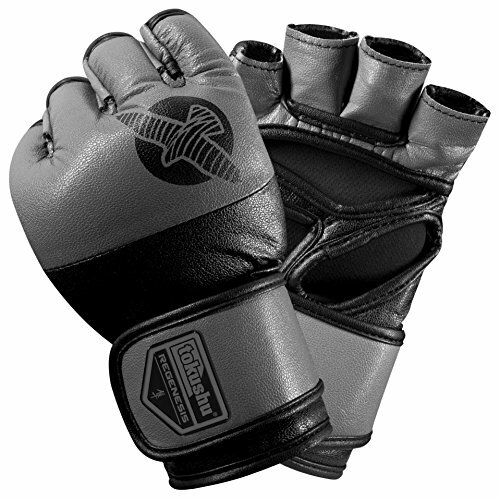 Develop punching power in the cage using authentic cowhide leather construction that adds to shock-resistance. Triangular Nabla-Palm design provides ultimate grip and ventilation. Quick and easy velcro closure provides just the right kind of snug-fit necessary for wrist-protection and better punching form. Fit for all martial arts, this pair will make all the difference in your game. We gave the RDX MMA Gloves a Guru Score of 8.5/10 because of the incredible value and great reviews on Amazon. The Everlast MMA Gloves offer premium synthetic leather along with excellent glove construction that provides long lasting durability and functionality. The best part of this glove is the EverDri technology which keeps gloves cool and dry even after a long training session. These gloves are excellent grappling gloves, however, they don’t provide the best support for your palm. The Everlast MMA Gloves includes a full wrist wrap strap which provides superior wrist support and allows for a more customizable fit. 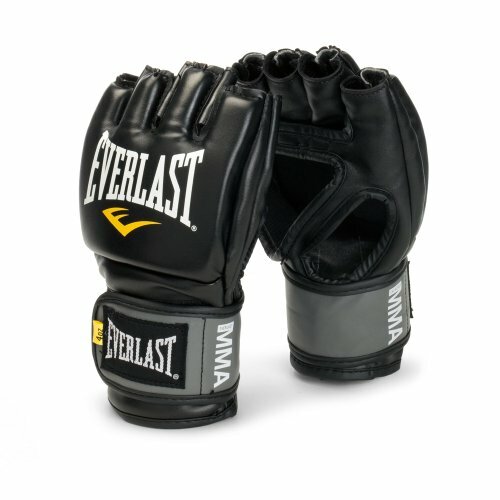 We gave the Everlast MMA Gloves a Guru Score of 7.5/10 because they are inexpensive and a great value for beginners. The Combat Sports MMA Gloves meet all state regulations for professional competition requirements. These gloves are 5 ounce and have 3/4 inch padding for increased safety of the hands and opponent. They provide an open palm design that is great for grappling and allows full gripping capabilities. Made of a synthetic leather construction for resiliency and longevity. 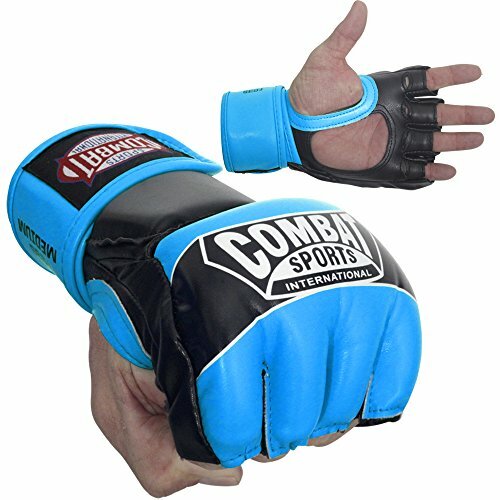 I would recommend the Combat Sports MMA Gloves for beginners or kids that need MMA style gloves. These aren’t the most durable gloves when compared to other gloves on this list, however they will do the job for light sparring. We gave the Combat Sports MMA Gloves a Guru Score of 7.5/10 because they are inexpensive and hold a good value for beginners and kids. The all-new Tokushu Regenesis MMA Gloves are now better than ever. Constructed with an ergonomically-improved 30% pre-curve design while still featuring the patented Dual-X Wrist Closure system, these premium gloves provide maximum protection and power generation. Anti-microbial inner lining for ultimate comfort, Tokushu Regenesis MMA Striking Gloves are powered with exclusive Hayabusa AG inner fabric. These gloves feature “X-Static XT2”, an anti-microbial technology that delivers anti-odor properties. With these additions and it’s open-palm design, Tokushu Regenesis MMA Gloves keep your hands cool and comfortable at all times. We gave the Hayabusa Tokushu Regenesis a Guru Score of 9/10 because they are just about everything you could want in an MMA glove. The Hayabusa Regenesis are some of the best MMA gloves available today. 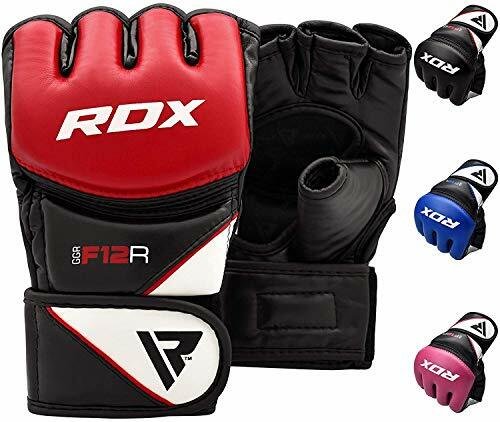 The RDX F12 MMA Gloves are perfect gloves for beginners looking to get into MMA. The resilient Maya-Hide synthetic construction makes these MMA gloves long-lasting, however not as durable as many other models. The polymax contoured padding curves over knuckles to deliver efficient protection against shock-impact. RDX improved their hook and loop closure to make it much more quick and easy to tightly fasten these gloves. RDX MMA Gloves have moisture wicking synthetic micro-fabric which draws moisture away from skin enabling hand comfort and breathability. We gave the RDX F12 a Guru Score of 8/10 because they hold a great value for beginners. The Sanabul Battle Forged MMA Grappling Glove is great for mixed martial arts training or sparring when you want to seamlessly transition between grappling and striking without having to change gloves. Technologically advanced and the fit shows it. 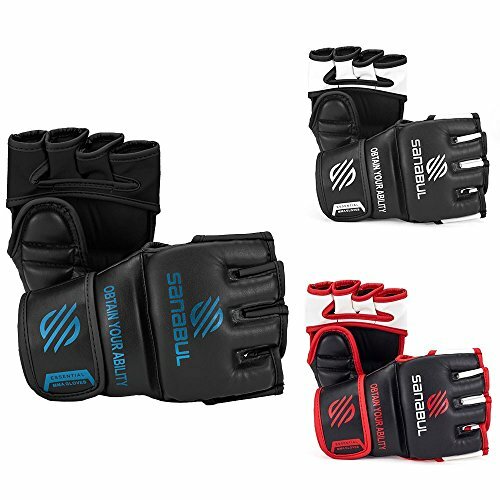 Similar to tradition MMA gloves but with the use of engineered leather, hand-shaped foam, and other modifications to provide added comfort and durability. Anti-microbial premium lining helps prevent the growth of bacteria and fungi. The premium lining also prevents excess moisture from being absorbed into the glove helping extend the lifespan of the glove. The velcro closure system allows you to easily put on MMA gloves even while wearing hand wraps underneath. We gave the Sanabul Battle Forged MMA Gloves a Guru Score of 8.5/10 because they have passed every single test to date, they are a great MMA glove that won’t let you down. 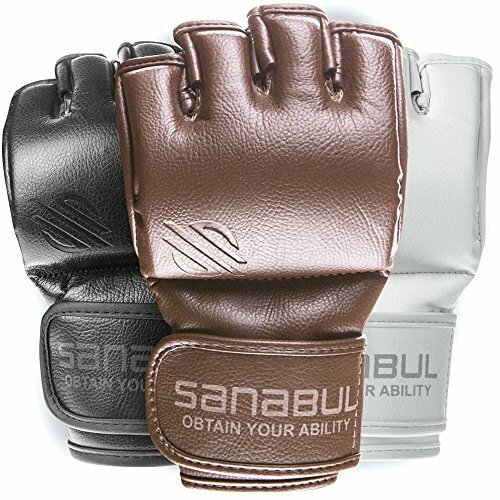 These are the best MMA gloves that Sanabul has designed so far. Venum Undisputed 2.0 MMA Gloves have been newly developed with a more comfortable and high quality design. With a curved shape that conforms to your hand, these gloves give you a better fit for a powerful punch. The new closure system provides a better fit for all sizes and allows closure with one hand. What I love most about the Venum Undisputed 2.0 MMA Gloves is the superior design and craftsmanship that isn’t offered anywhere else. The layered foam is second to none, and these gloves allow for a tight fit while feeling comfortable and mobile for grappling. 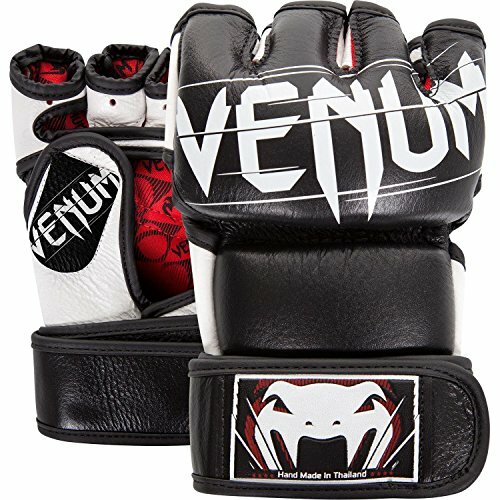 We gave the Venum Undisputed 2.0 a Guru Score of 9/10 because they are an excellent glove for advanced MMA fighters looking for a step up in quality. I love the Venum Undisputed 2.0 because Venum made serious improvements to one of the best MMA gloves already. 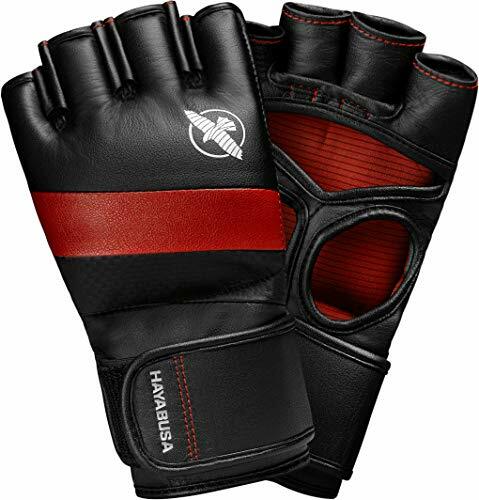 Sanabul Essential MMA Grappling Gloves are great for MMA training when you want to seamlessly transition between grappling and striking. High quality and durable material which is easier to clean and maintain when compared to other models. Dura-soft impact protection foam provides great protection and softness to help prevent injury to your hands while training. We love the innovative velcro closure system which allows you to easily put on your MMA gloves even while wearing hand wraps underneath. We gave the Sanabul Essential a Guru Score of 8/10 because they offer a great value for beginners. There are some of the best mma gloves for beginners. We know it’s not an easy task to find the perfect pair of MMA gloves for training or sparring. We hope that you found our guide helpful in your search for the perfect pair of gloves. Finding a pair of gloves that are comfortable yet efficient should be your number one goal when looking for MMA gloves. Every pair of gloves we included on this list has the capability of being the perfect pair for you. We realize combat sports is a serious topic when it comes to your safety and health. Training and sparring can be dangerous at times and we are grateful that you trust The MMA Guru’s decision when you search for your MMA, Boxing, Muay Thai, and Jiu Jitsu equipment. I wish you the best on your Martial Arts journey, and I hope today you found the best MMA gloves for your training.